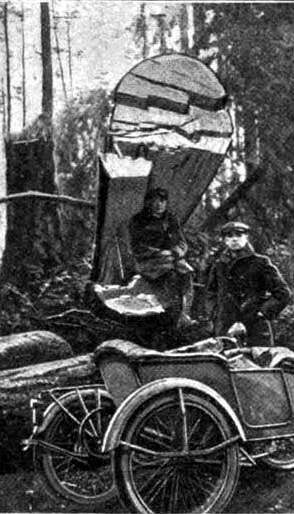 In the short space of two and one-half hours, a tornado which struck the Olympic Peninsula, Wash., destroyed a portion of one of the finest stands of timber in the world. The storm, which came without warning, is said to have reached a velocity of 180 miles an hour off the Columbia River. At North Head, the gusts reached an estimated velocity of 150 miles an hour, while the instrument indicated 126 miles an hour over a five-minute period and was then carried away. The instrument at the Lone Tree station, off Gray's Harbor, registered 140 miles an hour for a three-minute period. The affected area is on the most north-westerly portion of the United States and embraces approximately 2,200 square miles of virgin timber, both in the Olympic forest reserve and in private lands. The storm center seems to have been between the Hoh River and the Clearwater River. In this district many square miles of timber have been laid low. Much of it can be used, if salvaged immediately, but as the area is so great and logging conditions most unfavorable, much of it will be a total loss. Neither words nor pictures can adequately describe the condition of this area after the storm and even the human eye grasps but a small portion. 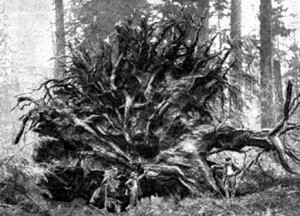 Trees that have withstood the elements for hundreds of years, which measured as much as 12 ft. in diameter, and which stood so closely together that the sun rarely reached the soft moss and fern-covered floor of the forest, now lie piled in a splintered, shattered mass as high as 50 ft. Timber "cruisers" state that with all landmarks gone, it will be impossible to cruise it without following the methods used on uncruised areas. Communication with the stricken area is by telephone and road running to the town of Port Angeles, on the Straits of Juan de Fuca. 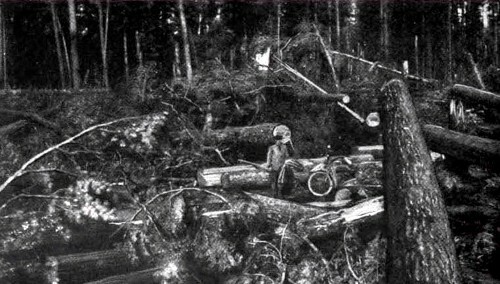 The distance to Forks, the largest community in the area, is less than 60 miles, yet it required 10 days to open up the road because of fallen timber. One of the first parties to enter the area was equipped with motorcycles and sidecars, which, being light, could be lifted over obstructions. There were four of the machines, and two motion-picture photographers in addition to the writer were carried. Although the sections we visited were the least affected, yet the loss was appalling. We drove in places through a lane banked high on both sides by the ends of logs. The obstructing sections had been sawed out and rolled aside. Mechanical saws were used by the road gangs. The single strand of telephone wire was pinned to earth in thousands of places. 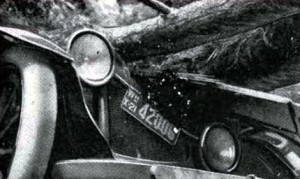 A splintered tree sawed in two to open the highway: A typical example of the many fine trees shattered and ruined for any purpose but pulp or fuel. The Olympic highway, over which we drove, considered one of the most beautiful in America for natural grandeur, is not ruined, yet the storm left its mark in many ways. Some stretches were untouched, others showed trees stripped of bark, while still others were swept so clean that but a few snags remained standing. In such places the ground was not visible, because of the mass of timber. Much of this, though on the road and within easy reach of auto trucks, is so badly shattered as to be useless for anything save fuel or pulp. In some areas the tornado broke off the tops and dropped them below, while in others, where the ground was different, the stunning spectacle of a great forest uprooted presented itself. Not one nor a dozen trees, but thousands of trees, lay with upturned roots high above us. In one place, a spruce six or eight feet in diameter had been snapped off a few feet above the ground. Where the remainder is, is a mystery. It was not within a radius of 200 yards. 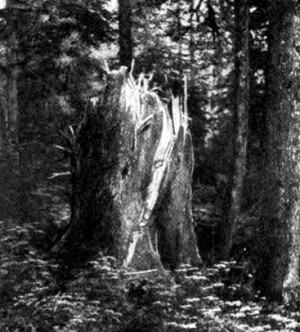 The shattered stump of a spruce tree over six feet in diameter: The upper part could not be found. While at the present writing the worst of it, in the Hoh River district, has not been touched, or even photographed, a few facts regarding road clearing are of interest. 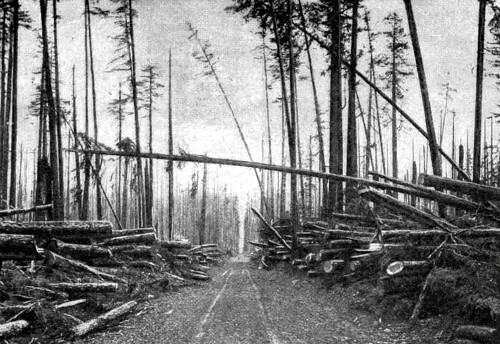 In a stretch of three miles on the Clallam road 1,500 trees were sawed through to open up the road. They varied in size from saplings to giants of the forest. Aside from the cost of removal of timber from the roads, the highways suffered damage in an interesting manner. Though gravel, they were soft from heavy rains. When the trees crashed fairly onto the road the great impact hollowed out a cross section several inches in depth, forming a rut that made it necessary to life our motorcycles out. A single vista in the vast area of down timber: The road, discernible only because of the motorcycle on it, has been partly opened by sawing through the logs that had fallen across it, which explains the clean-cut ends of many of the sticks in sight. Though the storm occurred on January 29, it was not until late in February that a party of three men made their way into and out of the Hoh River country. Members of that party state they made most of the distance from log to log, often 40 and 50 ft. above ground; that for miles in every direction the conditions seemed to be the same. Working 12 hours a day, it required four days to cover 20 miles. They also found evidence of a fearful destruction of game. It is believed hundreds of elk and smaller game have perished, as no living thing, except a cat, could have made its way through the debris. One magnificent buck was found cut in two. A six-foot spruce had caught him in the act of leaping a log. A region of smaller timber, where the road has been opened by sawing through actual thousands of sticks of the average size of telephone poles, a Herculean task that was performed with remarkable speed. Perhaps one hundred people, who have homes in this district, are now making desperate efforts to get out. They say their cattle are destroyed and provisions getting low. The men of the district have banded together and are literally sawing their way out. After having worked two weekends, they had cut a lane a mile and one-half in length, with 20 yet to go. Nothing could keep those people there this summer, for they, like everybody else, realize the tremendous fire hazard, and believe that the whole section, and possibly a large section of the remainder of the Olympic forest, is due to go up in smoke. Two thousand square miles of timber, mowed down like grain, covered with leaves and branches above and below, and saturated with sap and pitch until the air is heavy with it at times, makes a fire menace hard to combat. The governor of Washington quit in the midst of a session of the legislature to visit the scene, as did others. They were accompanied by U.S. forestry supervisors. All expected to find the damage overestimated. The contrary was the case. Another typical scene: The upturned roots of a giant tree, with smaller timber standing unharmed in the background. In round numbers the loss is as follows:8,000,000,000 board -feet of hemlock spruce, cedar, and fir down, a portion of which can be salvaged, if done immediately. Estimated in money the loss is $150,000,000. And though every known effort will be made to combat it, yet this loss may reach the billion mark if fire once gets a fair start this summer. This article is a reprint from the May 1921 issue of Popular Mechanics.